Another (really) old level that I just finished playing. Added a few last puzzlez to complete it, it's not very wide but considerably tall. Getting close on this one ... there is a Gold (unbreakable) Brickz mini-puzzle that I haven't been able to get through. And I seem to be short a few Gruntz of being able to complete the CL, because two of the solver's Gruntz are using Bombz (two deaderz) in removing those Gold Brickz ... and a third Bomber is required ... and he needz to make a 180 degree turn, and then a diagonal run. A toy is available to stop him, but getting him to follow long enough without lighting his fuse is a challenge. Perhapz I have done thingz in the wrong order, and it should have been possible to get the Gruntz available onto the three Purple Multi-Grunt Switchez before they have to make kamikaze runz. But (with only one SAVE slot) that meanz another re-start from the beginning. Well, I haven't quite finished this one ... need to figure out how to fill the last three Purple Multi-Grunt Switchez in order to free Grunt #5 so he may polish off the last enemy obstaclez, and pick up the Warpstone and carry it into the King's Fortress. I can easily fill two of the three PMGSz, but the third one appearz to involve getting an enemy Grunt to follow closely behind the solver's Grunt across a Crumbling Bridge ... without stepping on any Tilez except the onez the solver's Grunt stepz on! 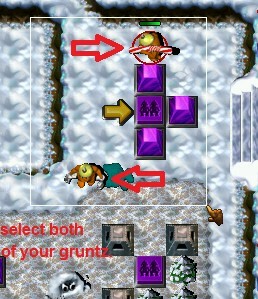 Then leave the enemy Grunt stranded, standing on the PMGS while solver's Grunt makez his getaway to fill the easy PMGS. I have dilly-dallyed with it long enough, so that I will distribute it without my usual successful verification. You younger Gruntzerz probably won't have any problem solving that last puzzle. Do you need 2 gruntz through the black pyramide in the start (gauntlez and gooberz?? Is my hat too big? 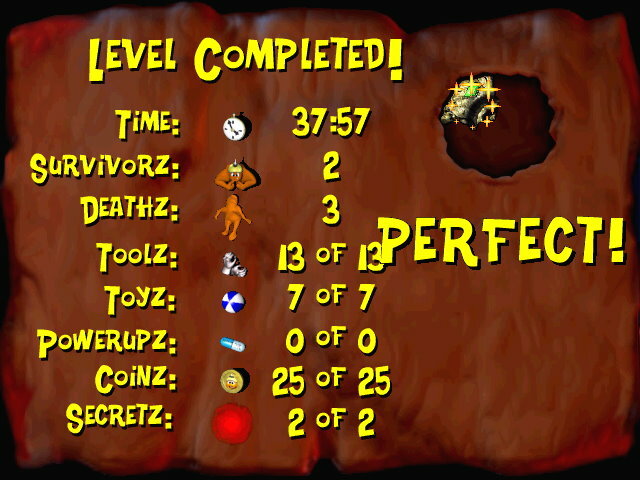 I managed to complete the level, great challenge! Though I missed the well hidden secret and a different coin. I have been working on a walk-through for this CL, and needed to view some thingz, so played it up to the point where I could see what I needed to see. Then I continued all the way to the end ... and ... managed the "PERFECT!". I took almost 38 minutez, but everything worked just as I thought it did, including the final challenge of filling three Purple Multi-Grunt Switchez with only one solver's Grunt. I am NOT a very lucky individual, so much of my time loss over the Designer's was in the random action areaz: start-up with one TimeBomber and the four ranged weapon Gruntz ... and the tight timing with Gauntletz and Bricklayer vs the enemy Gauntletz Grunt. Dealing with the four thirsty onez was also cause for loss of hair. And wat this mean "Notice how only gauntletz is selected after he passez through the BPz and is ordered to move to free space.^""
Do you need 2 gruntz get through the BP and how (sorry to ask it again but i can not get both through to BP". I am NOT a very lucky individual, so much of my time loss over the Designer's was in the random action areaz: start-up with one TimeBomber and the four ranged weapon Gruntz ... and the tight timing with Gauntletz and Bricklayer vs the enemy Gauntletz Grunt. I still say it's not random... once you know how far the enemy can detect you, there are spotz where you can reliably trap him every time you play through. You are past one of the most difficult partz. 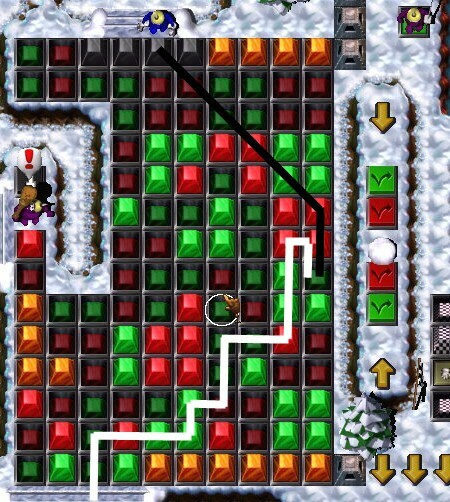 From this point on, frequent SAVEz will allow you to figure out what must be done in each mini-puzzle. Just pay attention to what enemy Gruntz do each time you encounter a new one. At timez, their attackz against you can actually help you in some way. "Hah! Missed me!" and someone else sayz "ouch!". It can be a very confusing puzzle, but once you find the proper path (and I'm sure there is more than one solution to it, though I've never really tried to find more) it's a piece of cake. Try this. I am stuck at point where i have gauntletz and brick layer. 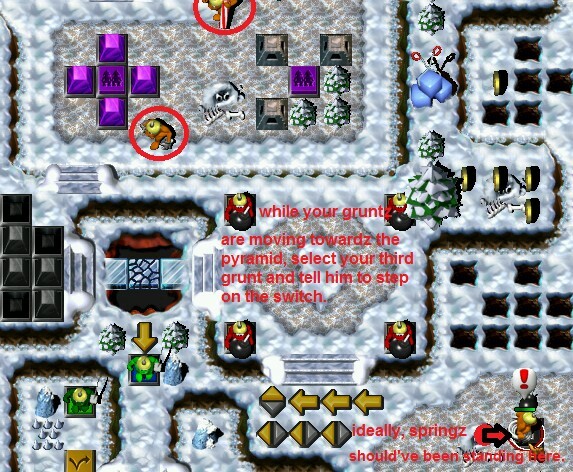 there are enemy gauntletz and i have to lure them so they break the icicles and i should get time to make black brick so that it gets blown up to free the toy. It seems too tight - any help? It has been a while since I played this one, so my memory may not be perfect about it. Bricklayer has an explosive Brick which he will lay on the Foundation tile next to the Gold Brick. One enemy Gauntletz Grunt will break the Explosive Brick on top of the stack next to him; the next enemy Gauntletz Grunt will remove the rest of the stack and attack your Gauntletz and Bricklayer Grunt ... who are on the other side of the Squeaky Toy Brick stack ... tight timing for Bricklayer to lay the Explosive Brick and step away from it. Gauntletz then breaks the rest of the stack to get the Squeak Toy. 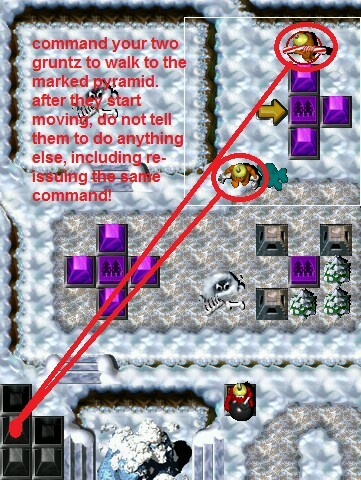 Both Gruntz move to the stairway while the last Gauntletz Grunt is playing with the toy. 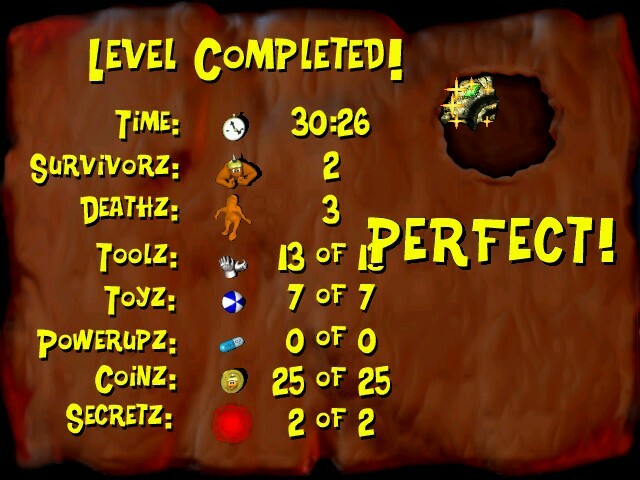 Thanks, I finished the level but missed one secret. The secret I got was triggered by stepping on spikes. Where is the other secret? So you found the SecretTeleporterTrigger (Red Warp) but not the Question Mark Switch. 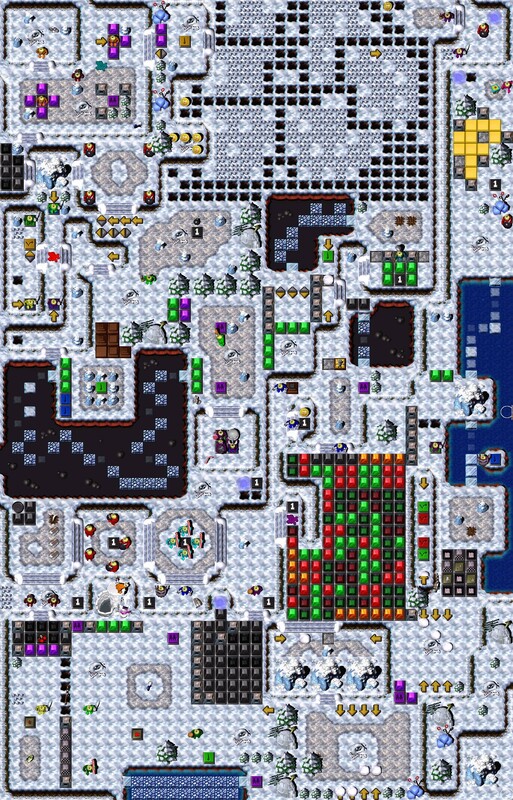 Apparently you failed to dig up a Mound, or break an Ice Crystal. Wave those toolz around!